On August 20, 2008, the FISC issued a supplemental opinion approving the use of “a specific intelligence method in the conduct of queries (term “searches”) of telephony metadata or call detail records obtained pursuant to the FISC’s orders under the BR FISA program.” The government claims that it cannot release any part of that August 20, 2008 opinion, which given the timing (which closely tracks with the timing of other submissions and approvals before the FISC) and the reference to both telephony metadata and call detail records almost certainly approves the use of the dragnet — and probably not just the phone dragnet — to establish correlations between a target’s multiple communications identifiers. As ODNI’s Jennifer Hudson described in a declaration in the EFF suit, the government maintains that it cannot release this opinion, in spite of (or likely because of) ample description of the correlations function elsewhere in declassified documents. The opinion is only six pages in length and the specific intelligence method is discussed at great length in every paragraph of this opinion, including the title. Upon review of this opinion, I have determined that there is no meaningful, segregable, non-exempt information that can be released to the plaintiff as the entire opinion focuses on this intelligence method. Even if the name of the intelligence method was redacted, the method itself could be deduced, given other information that the DNI has declassified pursuant to the President’s transparency initiative and the sophistication of our Nation’s adversaries [Ed: did she just call me an “adversary”?!?] and foreign intelligence services. The intelligence method is used to conduct queries of the bulk metadata, and if NSA were no longer able to use this method because it had been compromised, NSA’s ability to analyze bulk metadata would itself be compromised. A lost or reduced ability to detect communications chains that link to identifiers associated with known and suspected terrorist operatives, which can lead to the identification of previously unknown persons of interest in support of anti-terrorism efforts both within the United States and abroad, would greatly impact the effectiveness of this program as there is no way to know in advance which numbers will be responsive to the authorized queries. ACLU’s snazzy new searchable database shows that this correlations function was discussed in at least three of the officially released documents thus far: in the June 25, 2009 End-to-End Review, in a June 29, 2009 Notice to the House Intelligence Committee, and in the August 19, 2009 filing submitting the End-to-End Review to the FISC. In addition to making it clear this practice was explained to the FISC just before the Supplemental Opinion in question, these documents also describe a bit about the practice. And they reveal that until February 6, 2009, this tool provided “automated correlation results to BR FISA-authorized analysts.” While the practice was shut down in February 2009, the filings make clear NSA intended to get the automated correlation functions working again, and Hudson’s declaration protecting an ongoing intelligence method (assuming the August 20, 2008 opinion does treat correlations) suggests they have subsequently done so. When this language about correlations first got released, it seemed it extended only so far as the practice — also used in AT&T’s Hemisphere program — of matching call circles and patterns across phones to identify new “burner” phones adopted by the same user. That is, it seemed to be limited to a known law enforcement approach to deal with the ability to switch phones quickly. 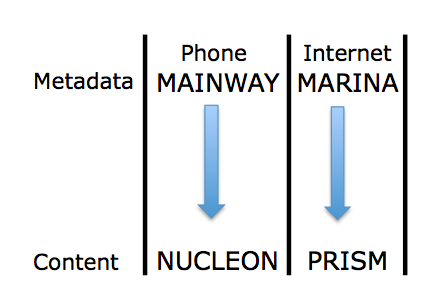 But both discussions of the things included among dragnet identifiers — including calling card numbers, handset and SIM card IDs — as well as slides released in stories on NSA and GCHQ’s hacking operations (see above) make it clear NSA maps correlations very broadly, including multiple online platforms and cookies. Remember, too, that NSA analysts access contact chaining for both phone and Internet metadata from the same interface, suggesting they may be able to contact chain across content type. Indeed, NSA presentations describe how the advent of smart phones completely breaks down the distinction between phone and Internet metadata. In addition to mapping contact chains and identifying traffic patterns NSA can hack, this correlations process almost certainly serves as the glue in the dossiers of people NSA creates of individual targets (this likely only happens via contact-chaining after query records are dumped into the corporate store). Now it’s unclear how much of this Internet correlation the phone dragnet immediately taps into. And my assertion that the August 20, 2008 opinion approved the use of correlations is based solely on … temporal correlation. Yet it seems that ODNI’s unwillingness to release this opinion serves to hide a scope not revealed in the discussions of correlations already released. Which is sort or ridiculous, because far more detail on correlations have been released elsewhere. 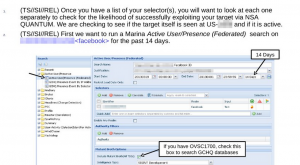 Der Speigel has posted a set of slides associated with their story on how NSA’s TAO hacks targets. The slides explain how analysts can find identifiers (IPs, email addresses, or cookies) they can most easily use to run a Quantum attack. 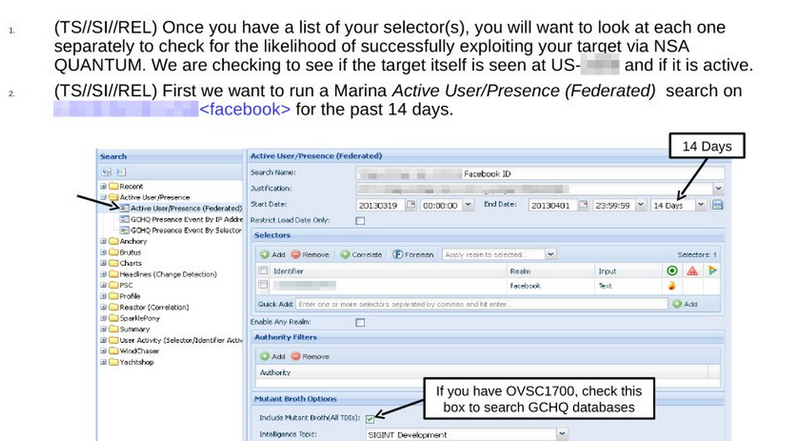 Because NSA is most successful hacking Yahoo, Facebook, and static IPs, it walks analysts through how to use Marina (or “QFDs,” which may be Quantum specific databases) to find identifiers for their target on those platforms. 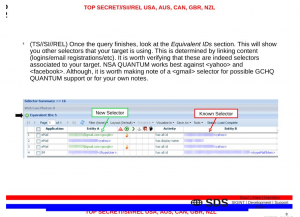 If they can’t find one of them, it also notes, analysts can call on GCHQ to hack Gmail. Once they find other identifiers, they can see how often the identifier has been “heard,” and how recently, to assess whether it is a still-valid identifier. The slides are fascinating for what they say about NSA’s hacking (and GCHQ’s apparent ability to bypass Google’s encryption, perhaps by accessing their own fiber). But they’re equally interesting for what they reveal about how the NSA is using Internet metadata. This confirms something — about Internet metadata, if not yet phone metadata — that has long been hinted. In addition to using metadata to track relationships, they’re also using it to identify multiple identities across programs. This makes plenty of sense, since terrorists and other targets are known to use multiple accounts to hide their identities. Indeed, doing more robust such matching is one of the recommendations William Webster made after his investigation of Nidal Hasan’s contacts with Anwar al-Awlaki, in part because Hasan contacted Awlaki via different email addresses. But it does raise some issues. First, how accurate are such matches? The NSA slides implicitly acknowledge they might not be accurate, but it provides no clues how analysts are supposed to “verify that these are indeed selectors associated to your target.” In phone metadata documents, there are hints that the FISC imposed additional minimization procedures for matches made with US person identifiers, but it’s not clear what kind of protection that provides. Also, remember NSA was experiencing increased violation numbers in early 2012 in significant part because of database errors, and Marina errors made up 21% of those. If this matching process is not accurate, that may be one source of error. Also, note that NSA itself calls this “content,” not metadata. It may be they’ve associated such content via other means, not just metadata collection, but given NSA’s “overcollection” of metadata under the Internet dragnet, almost certainly collecting routing data that count as content, it does reflect the possibility they themselves admit this goes beyond metadata. Moreover, this raises real challenges to NSA claims that they don’t know the “identity” of the people they track in metadata. Now, none of this indicates US collection (though it does show that NSA continues to collect truly massive amounts of Internet traffic from some location). But the slide above does show NSA monitoring whether this particular user was “seen” at US-[redacted] in the last 14 days. 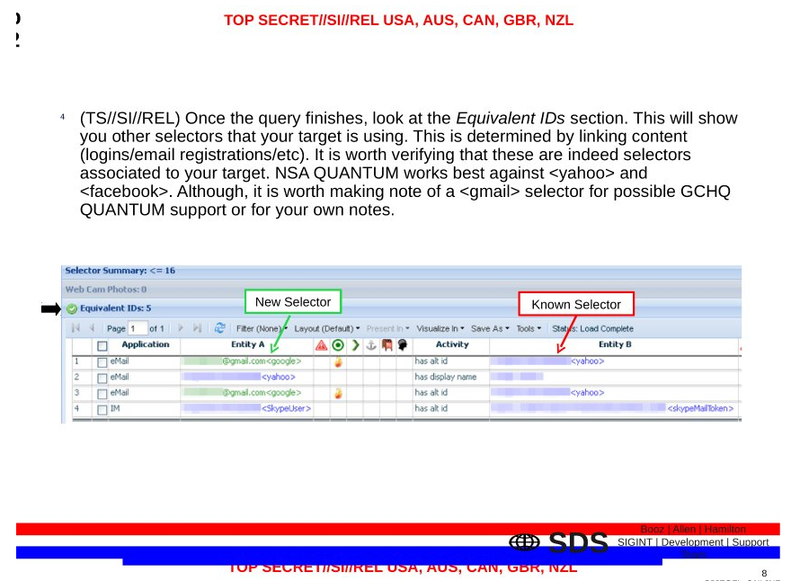 US-[redacted] is presumably a US-associated SIGAD (collection point). (They’re looking for a SIGAD from which they can successfully launch Quantum attacks, so seeing if their target’s traffic uses that point commonly.) While that SIGAD may be offshore, and therefore outside US legal jurisdiction, it does suggest this monitoring takes place within the American ambit. 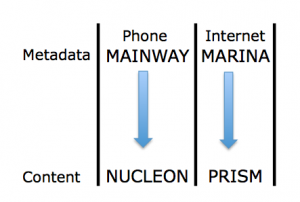 At least within the Internet context, Marina functions not just as a collection of known relationships, but also as a collection of known data intercepts, covering at least a subset of traffic. They likely do similar things with international phone dragnet collection and probably the results of US phone dragnet in the “corporate store” (which stores query results). In other words, this begins to show how much more the NSA is doing with metadata than they let on in their public claims. Update: 1/1/14, I’m just now watching Jacob Appelbaum’s keynote at CCC in Berlin. He addresses the Marina features at 22:00 and following. He hits on some of the same issues I do here. It’s a shame Halloween has already come and gone. The reaction to Monday’s Washington Post The Switch blogpost reminds of a particularly scary horror story, in which a young woman alone in a home receives vicious, threatening calls. In reality the caller is camped directly outside the woman’s window, watching every move she makes even as she assures herself that everything is fine. After a tepid reaction to the initial reporting last week, most media and their audience took very little notice of the Washington Post’s followup piece — what a pity, as it was the singular voice confirming the threat sits immediately outside the window. Your window, as it were, if you have an account with either Yahoo or Google and use their products. The National Security Agency has access to users’ content inside the corporate fenceline for each of these social media firms, greasy nose pressed to glass while peering in the users’ windows. There’s more to story, one might suspect, which has yet to be reported. 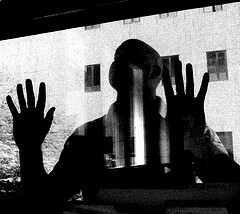 The disclosure that the NSA’s slides reflected Remote Procedure Calls (RPCs) unique to Google and Yahoo internal systems is only part of the picture, though this should be quite frightening as it is. 1) Access to content and commands moving in and out of Google’s and Yahoo’s servers, between their own servers — the closest thing to actually being inside these corporations’ servers. 2) With these RPCs, the NSA has the ability to construct remote login access to the servers without the businesses’ awareness. RPCs by their nature require remote access login permissions. 3) Construction through reverse engineering of proprietary RPCs could be performed without any other governmental bodies’ awareness, assuming the committees responsible for oversight did not explicitly authorize access to and use of RPCs during engineering of the MUSCULAR/SERENDIPITY/MARINA and other related tapping/monitoring/collection applications.